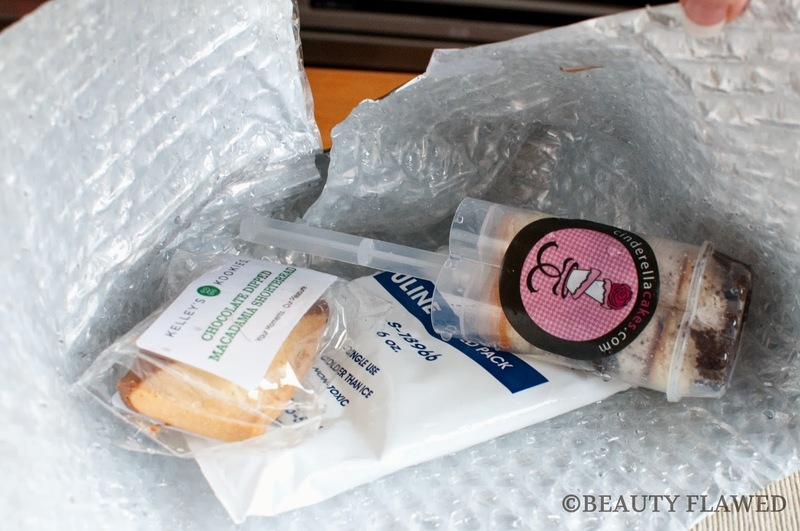 I'm a little late writing about this month's Orange Glad Sweet Box because two items in my first shipment were damaged. That's why the above feature picture looks a little light, below you can see the two damaged sweets. A Cinderella Cakes Oreo Cookie Cake Push Pop and a Kelley's Kookies Chocolate-Dipped Macadamia Shortbread cookie, as you can see in the picture there are beads on the products and those are not water my friends. The ULINE pack had a leak in it and soaked the cookie wrapper so much it came open and I'm sure soaked into the cake pop as well. Orange Glad quickly replaced both of these products for me after emailing them about it. Cinderella Cakes is a bakery that has been featured on shows like TLC's The Ultimate Cake Off, so I had high hopes for this sweet. After tasting this I have mixed feelings about this cake push pop. I love that it's inventive but the flavors were a bit of a problem. The chocolate part tasted like it had some sort of artificial sweetener in it and the Oreo fluff part was good but had a strange texture. I really only enjoyed the yellow cake parts. The ingredient list is also quite odd I don't think it's right to be honest with you guys. Ingredients: Oreo cookies, Flour, Sugar, Vegetable oil, Pastry pride, Timorie Budge, Cinderella Cakes Timorie's Candies. At first glance the ingredients seem legit until you get to the part about Timorie Budge... because that can't be right because that would mean they put the owner of Cinderella Cakes in the cake push pop. I'm assuming it's just a error but still I find it strange. 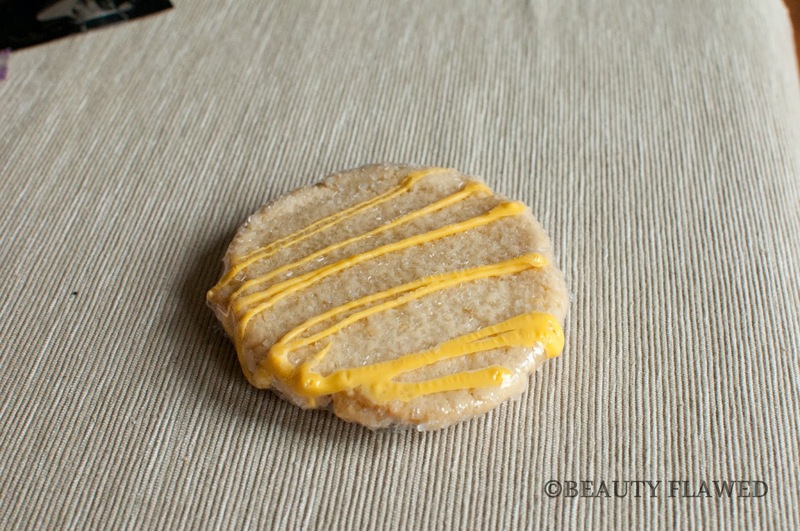 This was a quite tasty little shortbread cookie and the chocolate added the perfect touch of sweetness to it. I enjoyed this cookie as did my boyfriend who I had to split it with. Ingredients: Wheat flour enriched, butter, milk chocolate coating, sugar, palm kernel and partially hydrogenated palm oils, whey, cocoa, nonfat milk, sorbitan monosterate and lecithin emulsifiers, pure vanilla and vanillin, sugar and macadamia nuts. Another Cinderella Cakes product and I did like this one but found that it was a little hard for a sugar cookie. The sugar crystals on the top also made it quite messy but the lemon drizzle sort of made up for it. Ingredients: Flour, Sugar, Butter, Eggs, Lemon Extract. 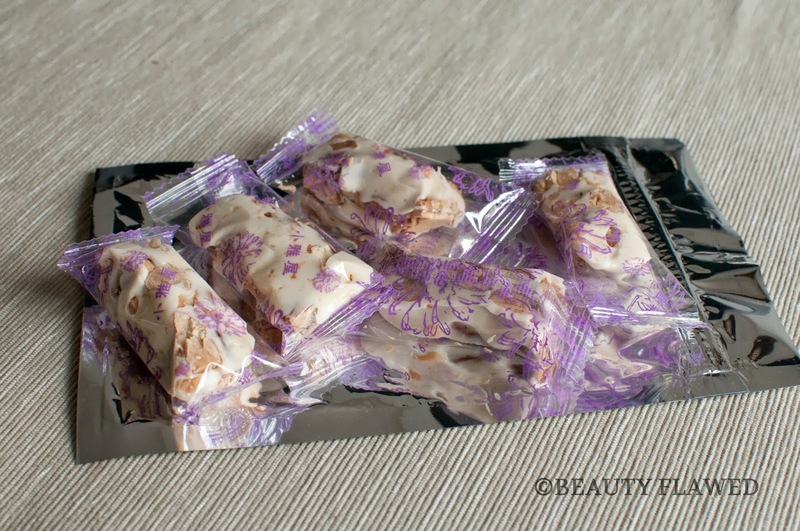 I'm not even sure these can be considered "nougat" because it goes beyond just being chewy or hard. I tried to bite into these and found it not worth the effort. In my brief attempt at eating these I found they were quite flavorless and dry. To be honest I was really afraid these would rip out my fillings because they are that chewy so I didn't actually get to enjoy these. Ingredients: Maltose, Sugar, Butter, Milk Powder, Egg White, and Almond. These were simply stunning visually the patterns they fixed to these cookies are really cool and the color scheme is impressive. Taste wise I will say they were unique but a bit on the hard side I think if they were softer they would have been better. Almond Spice Cookie: Butter, Sugar, Eggs, Flour, Salt, Vanilla, Cinnamon, Nutmeg, Ground Ginger, Ground Cloves, and Sliced Almonds. I did like some of the items in this box even if some weren't exactly to my taste but that is the chance you take with subscriptions and hey I enjoy the gamble. The one big disappointment in this box for me was that "nougat" and it makes me wonder if the Orange Glad team is actually tasting any of these products for themselves. Surely I'm not the only one who found that to be entirely too hard to even eat. I am pleased by their fast customer service and the replacement of the damaged items I received so they get points for being quick and accommodating in that aspect. I have one more month with Orange Glad and it's not looking good for them to keep my business. Now I know my reviews may seem a bit critical at this point but I have to say I'm paying for this subscription and so far I've not been WOWed. 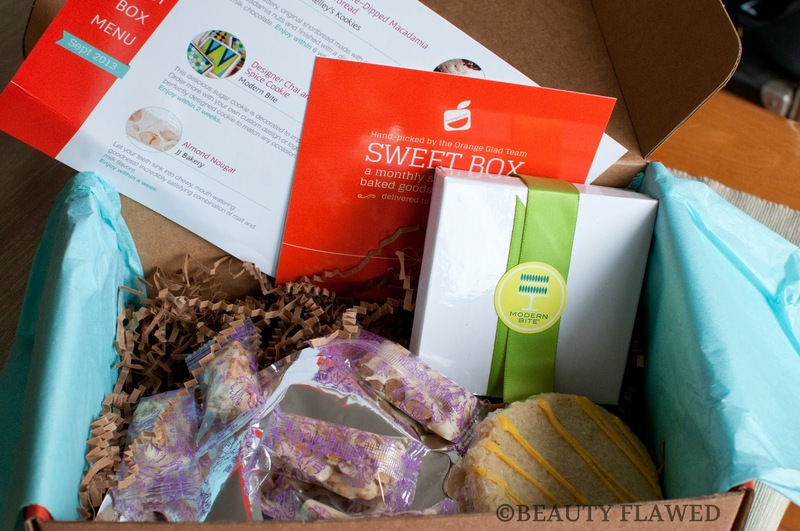 I wouldn't keep a beauty subscription around that was lackluster and the same applies to a food subscription more so even I think because these are things you are to eat. I did not do a value breakdown on this box because I couldn't find retail information for every product. I will say I kind of sort of feel like I got my money's worth because at least this month there were more products I enjoyed and the customer service was accommodating. What do you think of the September 2013 Orange Glad Sweet Box? I wouldn't mind trying treats in a box but I don't see anything in this box that I would really eat.